Drought is a major cause of agricultural, economic and environmental damage. Drought effects are apparent after a long period with a shortage of precipitation, making it very difficult to determine their onset, extent and end. Thus, it is hard to objectively quantify the characteristics of drought episodes in terms of their intensity, magnitude, duration and spatial extent. Much effort has been devoted to developing techniques for drought analysis and monitoring. Among these, the definition of quantitative indices is the most widespread approach, but subjectivity in the definition of drought has made it very difficult to establish a unique and universal drought index. Most studies related to drought analysis and monitoring systems have been conducted using either i) the Palmer Drought Severity Index (PDSI) (Palmer, 1965), based on a soil water balance equation, or ii) the Standardised Precipitation Index (SPI; McKee et al., 1993), based on a precipitation probabilistic approach. The PDSI was a landmark in the development of drought indices. It enables measurement of both wetness (positive value) and dryness (negative values), based on the supply and demand concept of the water balance equation, and thus incorporates prior precipitation, moisture supply, runoff and evaporation demand at the surface level. Many of the PDSI problems were solved by development of the self-calibrated PDSI (sc-PDSI) (Wells et al., 2004), which is spatially comparable and reports extreme wet and dry events at frequencies expected for rare conditions. Nevertheless, the main shortcoming of the PDSI has not been resolved. This relates to its fixed temporal scale (between 9 and 12 months), and an autoregressive characteristic whereby index values are affected by the conditions up to four years in the past (Guttman, 1998). It is commonly accepted that drought is a multi-scalar phenomenon. McKee et al. (1993) clearly illustrated this essential characteristic of droughts through consideration of usable water resources including soil moisture, ground water, snowpack, river discharges, and reservoir storages. The time period from the arrival of water inputs to availability of a given usable resource differs considerably. Thus, the time scale over which water deficits accumulate becomes extremely important, and functionally separates hydrological, environmental, agricultural and other droughts. For this reason, drought indices must be associated with a specific timescale to be useful for monitoring and management of different usable water resources. This explains the wide acceptance of the SPI, which is comparable in time and space (Hayes et al., 1999), and can be calculated at different time scales to monitor droughts with respect to different usable water resources. Precipitation-based drought indices including the SPI rely on two assumptions: i) the variability of precipitation is much higher than that of other variables, such as temperature and potential evapotranspiration (PET), and ii) the other variables are stationary (i.e. they have no temporal trend). In this scenario the importance of these other variables is negligible, and droughts are controlled by the temporal variability in precipitation. However, some authors have warned against systematically neglecting the importance of the effect of temperature on drought conditions. Empirical studies have shown that temperature rise markedly affects the severity of droughts. The role of warming-induced drought stress is evident in recent studies that have analysed drought impacts on net primary production and tree mortality (Williams et al., 2011; Martínez-Villalta et al., 2008; McGuire et al., 2010; Linares and Camarero, 2011). The strong role of temperatures on the drought severity was evident in the devasting 2003 central European heat wave, in which extreme high temperatures dramatically increased evapotranspiration and exacerbated summer drought stress (Rebetez et al., 2006), drastically reducing Aboveground Net Primary Production (ANPP) (Ciais et al., 2005). Similar patterns were observed in the summer 2010 with a strong heat wave that increased drought stress in forests and produced large forest fires in eastern Europe and Russia (Barriopedro et al., 2011). Thus, empirical studies have demonstrated that higher temperatures increase drought stress and enhance forest mortality under precipitation shortages (Adams et al., 2009). Warming processes are also probably the triggering factor of the decline in world agricultural productions observed in the last years (Lobell et al., 2011). Thus, to illustrate how warming processes are reinforcing drought stress and related ecological impacts worldwide, Breshears et al. (2005) enunciated the term global-change-type drought to refer to drought under global warming conditions. There has been a general temperature increase (0.5−2°C) during the last past 150 years, and climate change models predict a marked increase during the 21st century. It is expected that this will have dramatic consequences for drought conditions, with an increase in water demand due to evapotranspiration. Therefore, the use of drought indices which include temperature data in their formulation (such as the PDSI) is preferable, especially for applications involving future climate scenarios. However, the PDSI lacks the multi-scalar character essential for both assessing drought in relation to different hydrological systems, and differentiating among different drought types. Therefore a new drought index (the Standardized Precipitation Evapotranspiration Index; SPEI) has been formulated based on precipitation and PET. The SPEI combines the sensitivity of PDSI to changes in evaporation demand (caused by temperature fluctuations and trends) with the simplicity of calculation and the multi-temporal nature of the SPI. The SPI can not identify the role of temperature increase in future drought conditions, and independently of global warming scenarios can not account for the influence of temperature variability and the role of heat waves. The SPEI can account for the possible effects of temperature variability and temperature extremes beyond the context of global warming. Therefore, given the minor additional data requirements of the SPEI relative to the SPI, use of the former is preferable for the identification, analysis and monitoring of droughts in any climate region of the world. The SPEI fulfils the requirements of a drought index since its multi-scalar character enables it to be used by different scientific disciplines to detect, monitor and analyze droughts. Like the sc-PDSI and the SPI, the SPEI can measure drought severity according to its intensity and duration, and can identify the onset and end of drought episodes. The SPEI allows comparison of drought severity through time and space, since it can be calculated over a wide range of climates, as can the SPI. Moreover, Keyantash and Dracup (2002) indicated that drought indices must be statistically robust and easily calculated, and have a clear and comprehensible calculation procedure. All these requirements are met by the SPEI. However, a crucial advantage of the SPEI over other widely used drought indices that consider the effect of PET on drought severity is that its multi-scalar characteristics enable identification of different drought types and impacts in the context of global warming. As an example, Figure 1 shows the evolution of the sc-PDSI and the SPI at different time scales from 1910 to 2007 at the Indore observatory (India). The sc-PDSI has a unique time scale, in which the longest and most severe droughts were recorded in the decades 1910, 1920, 1950, 1960 and 2000. These episodes are also clearly identified by the SPI at long time scales (12−24 months). This provides evidence about the suitability of identifying and monitoring droughts using an index that only considers precipitation data. Moreover, this example shows the advantage of the SPI over the sc-PDSI, since the different time scales over which the SPI can be calculated allows the identification of different drought types. At the shortest time scales the drought series show a high frequency of drought, and moist periods of short duration. In contrast, at the longest time scales the drought periods are of longer duration and lower frequency. Thus, short time scales are mainly related to soil water content and river discharge in headwater areas, medium time scales are related to reservoir storages and discharge in the medium course of the rivers, and long time-scales are related to variations in groundwater storage. Therefore, different time scales are useful for monitoring drought conditions in different hydrological sub-systems. A reduction in precipitation due to climate change will affect the severity of droughts. The influence of a reduction in precipitation on future drought conditions is identified by both the sc-PDSI and the SPI. Figure 2 shows the evolution of the sc-PDSI and the 18-month SPI at the Albuquerque (New Mexico, USA) observatory between 1910 and 2007. Both indices were calculated using a hypothetical progressive precipitation decrease of 15% during this period. Both the modeled SPI and sc-PDSI series showed an increase in the duration and magnitude of droughts at the end of the century relative to the series computed with real data. As a consequence of the precipitation decrease, droughts recorded in the decades of 1970 to 2000 increased in maximum intensity, total magnitude and duration. In contrast, the humid periods showed the opposite behavior. Therefore, both indices have the capacity to record changes in droughts related to changes in precipitation. However, climate change scenarios also show a temperature increase during the 20th century. In some cases, such as the A2 greenhouse gas emissions scenario, the models predict a temperature increase that might exceed 4ºC with respect to the 1960−1990 average. Figure 3 shows the evolution of the sc-PDSI in Albuquerque, computed with real data between 1910 and 2007, but also considers a progressive increase of 2−4ºC in the mean temperature series. The differences between the sc-PDSI using real data and the two modeled series are also shown. This simple experiment clearly shows an increase in the duration and magnitude of droughts at the end of the century, which is directly related to the temperature increase. A similar pattern could not be identified using the SPI, demonstrating the shortcomings of this widespread index in addressing the consequences of climate change. The SPEI is really simple to calculate, and is based on the original SPI calculation procedure. The SPI is calculated using monthly (or weekly) precipitation as the input data. The SPEI uses the monthly (or weekly) difference between precipitation and PET. This represents a simple climatic water balance which is calculated at different time scales to obtain the SPEI. A number of equations exist to model PET based on available data (e.g. the Thornthwaite equation, the Penman-Monteith equation, the Hargreaves equation, etc), and the SPEI is not linked to any particular one. In the original version of the SPEI we used the Thornthwaite equation (Thornthwaite, 1948), wich was applied to obtain the SPEIbase v1.0. In the SPEIbase v2.0 we used the FAO-56 Penman–Monteith equation (Allen et al. 1998.
which provides a simple measure of the water surplus or deficit for the analyzed month. The calculated Di values are aggregated at different time scales, following the same procedure as for the SPI. Selection of the most suitable statistical distribution to model the D series was difficult, given the similarity among the four distributions (Pearson III, Lognormal, Log-logistic and General Extreme Value). The selection was based on the behavior at the most extreme values. Log-logistic distribution showed a gradual decrease in the curve for low values, and coherent probabilities were obtained for very low values of D, corresponding to 1 occurrence in 200 to 500 years. Additionally, no values were found below the origin parameter of the distribution. where α, β and γ are scale, shape and origin parameters, respectively, for D values in the range (γ > D < ∞). where Γ(β) is the gamma function of β. The method also solves the problem found for the no solution of the SPEI model in some regions of the world. For these reasons, we recommend SPEI calculation using Unbiased PWMs. for P≤0.5, P being the probability of exceeding a determined D value, P=1-F(x). If P>0.5, P is replaced by 1−P and the sign of the resultant SPEI is reversed. The constants are: C0=2.515517, C1=0.802853, C2=0.010328, d1=1.432788, d2=0.189269, d3=0.001308. The average value of the SPEI is 0, and the standard deviation is 1. The SPEI is a standardized variable, and it can therefore be compared with other SPEI values over time and space. An SPEI of 0 indicates a value corresponding to 50% of the cumulative probability of D, according to a Log-logistic distribution. Figure 4 shows the sc-PDSI, and the 3-, 12- and 24-monthly SPIs and SPEIs for Helsinki between 1910 and 2007. According to the sc-PDSI, the main drought episodes occurred in the decades of 1930, 1940, 1970 and 2000. These droughts are also clearly identified by the SPI and the SPEI. Few differences were apparent between the SPI and the SPEI series, independently of the time scale of analysis. This result shows that under climate conditions in which low interannual variability of temperature dominates, both drought indices respond mainly to the variability in precipitation. 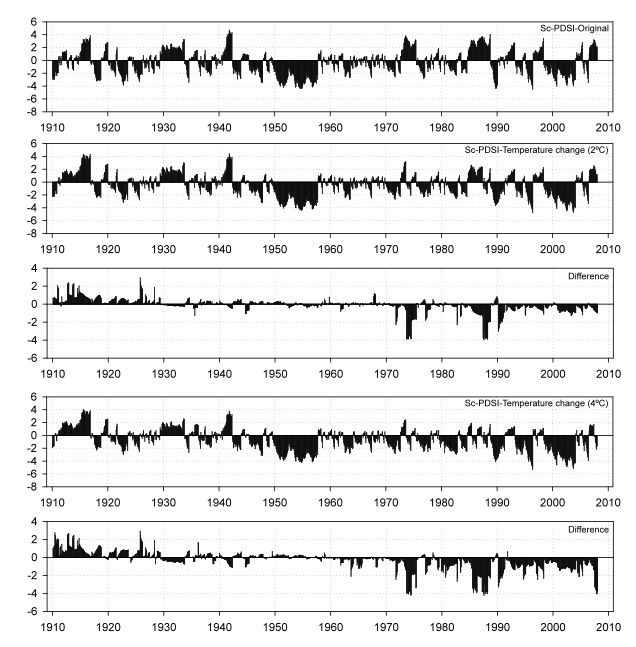 Figure 5 shows the time series of the sc-PDSI obtained using original and modeled series for the Valencia observatory (Spain). The 18-month SPI and SPEI obtained with that series are also shown. Using the original data, the sc-PDSI identified the most important droughts in the decades of 1990 and 2000. With a progressive temperature increase of 2ºC and 4ºC, the droughts increased in magnitude and duration at the end of the century. The SPI did not identify those severe droughts associated with a marked temperature increase, and it did not take into account the role of increased temperature in reinforcing drought conditions, as was shown by the sc-PDSI. In contrast, the main drought episodes were identified by the SPEI, with similar evolution to that observed for the sc-PDSI. Moreover, if temperature increased progressively by 2ºC or 4ºC, the reinforcement of drought severity associated with higher water demand by PET was readily identified by the SPEI, with the time series showing a high similarity to the sc-PDSI observed under warming scenarios. Figure 6 compares the SPEI and the sc-PDSI under a 4ºC temperature increase scenario throughout the analysis period at the Tampa (Florida, USA) observatory. Under this warming scenario, the sc-PDSI shows quasi-continuous drought conditions between 1970 and 2000, with some minor humid periods. The persistent drought conditions during this period are also clearly identified by the SPEI, independent of the analysis time scale. Thus, the sc-PDSI provides the same information as the SPEI at time scales of 7 to 10 months (R values between 0.850 and 0.857), but Figure 6 clearly shows that the SPEI also provides information about drought conditions at shorter and longer time scales. Vicente-Serrano S.M., Santiago Beguería, Juan I. López-Moreno, (2010) A Multi-scalar drought index sensitive to global warming: The Standardized Precipitation Evapotranspiration Index - SPEI. Journal of Climate 23: 1696-1718. Vicente-Serrano, S.M., Santiago Beguería, Jorge Lorenzo-Lacruz, Jesús Julio Camarero, Juan I. López-Moreno, Cesar Azorin-Molina, Jesús Revuelto, Enrique Morán-Tejeda and Arturo Sánchez-Lorenzo. (2012) Performance of drought índices for ecological, agricultural and hydrological applications. Earth Interactions 16, 1-27. Vicente-Serrano, S.M., Gerard Van der Schrier, Santiago Beguería, Cesar Azorin-Molina, Juan-I. Lopez-Moreno (2015). Contribution of precipitation and reference evapotranspiration to drought indices under different climates. Journal of Hydrology 426: 42-54. Abiodun, B.J., Ayobami T. Salami, Olaniran J. Matthew, Sola Odedokun (2012): Potential impacts of afforestation on climate change and extreme events in Nigeria. Climate Dynamics, DOI 10.1007/s00382-012-1523-9. Allen, K.J., J. Ogden, B. M. Buckley, E. R. Cook, P. J. Baker (2011): The potential to reconstruct broadscale climate indices associated with southeast Australian droughts from Athrotaxis species, Tasmania. Climate Dynamics 37: 1799-1821. Boroneant C., Ionita M., Brunet M., Rimbu N. (2011). CLIVAR-SPAIN contributions: Seasonal drought variability over the Iberian Peninsula and its relationship to global sea surface temperature and large scale atmospheric circulation. WCRP OSC: Climate Research in Service to Society, 24-28 October 2011, Denver, USA. Camarero, J.J., Sangüesa, G., Alla, A.Q., González de Andrés, E., Maestro, M. y Vicente-Serrano, S.M., (2012): Los precedentes y la respuesta de los árboles a sequías extremas revelan los procesos involucrados en el decaimiento de bosques mediterráneos de coníferas. Ecosistemas, 21: 22-30. Deng F., Chen J.M. (2011). Recent global CO2 flux inferred from atmospheric CO2 observations and its regional analyses. Biogeosciences Discussions 38, 3497-3536, doi:10.5194/bgd-8-3497-2011. Drew, D.M., Kathryn Allen, Geoffrey M. Downes, Robert Evans, Michael Battaglia and Patrick Baker (2012): Wood properties in a long-lived conifer reveal strong climate signals where ring-width series do not. Tree Physiology doi: 10.1093/treephys/tps111. Lorenzo-Lacruz, J., Vicente-Serrano, S.M., López-Moreno, J.I., Beguería, S., García-Ruiz, J.M., Cuadrat, J.M. (2010) The impact of droughts and water management on various hydrological systems in the headwaters of the Tagus River (central Spain). Journal of Hydrology, 386: 13-26. Martin-Benito, D., Hans Beeckman, Isabel Cañellas (2012): Influence of drought on tree rings and tracheid features of Pinus nigra and Pinus sylvestris in a mesic Mediterranean forest. European Journal of Forest Research, DOI 10.1007/s10342-012-0652-3. Nadal-Romero, E., Vicente-Serrano, S.M., Jiménez, I. (2012) Assessment of badland dynamics using multi-temporal Landsat imagery: an example from the Spanish Pre-Pyrenees. Catena 96: 1-12. Nogués-Bravo, D., J.I. López-Moreno and S.M. Vicente-Serrano (2012): Climate change and its impact. In Mediterranean Mountain Environments, First Edition. Edited by Ioannis N. Vogiatzakis. John Wiley & Sons, Ltd.
Paulo, A.A., Rosa, R.D. and Pereira, L.S. (2012): Climate trends and behaviour of drought indices based on precipitation and evapotranspiration in Portugal. Natural Hazards and Earth System Sciences, 12: 1481-1491. Potop, V., (2011): Evolution of drought severity and its impact on corn in the Republic of Moldova. Theoretical and Applied Climatology 105: 469-483. 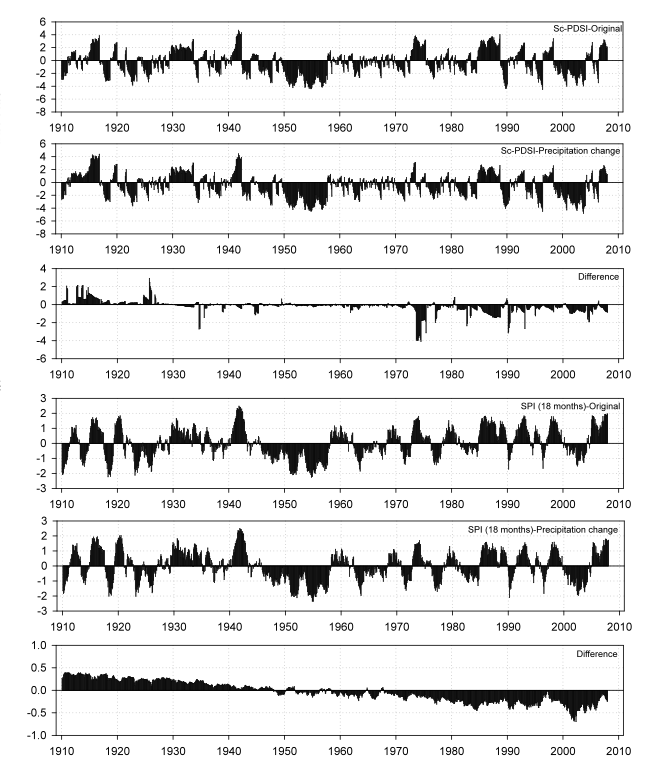 Potop, V., Možný, M., Soukup, J., (2012): Drought at various time scales in the lowland regions and their impact on vegetable crops in the Czech Republic. Agric Forest Meteorol 156: 121-133. Spinoni, J., T. Antofie, P. Barbosa, Z. Bihari, M. Lakatos, S. Szalai, T. Szentimrey, and J. Vogt (2013): An overview of drought events in the Carpathian Region in 19612010. Adv. Sci. Res., 10, 21-32. 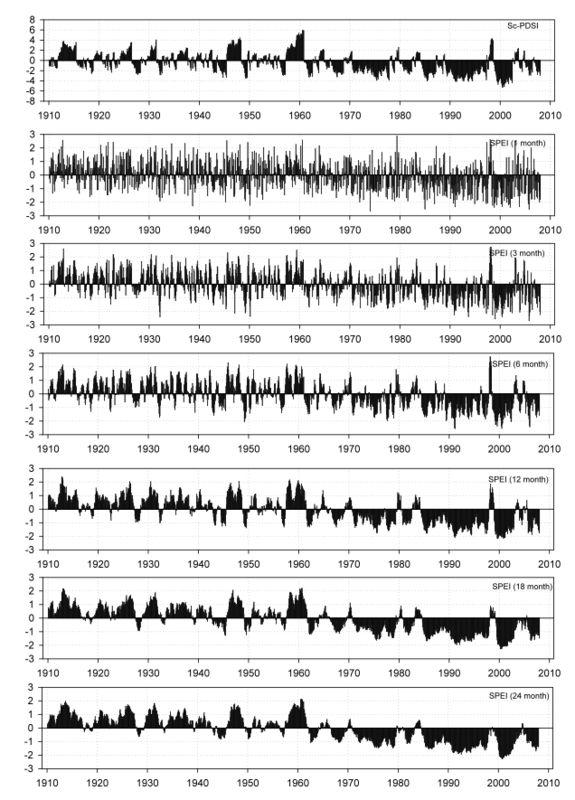 Su, H., Li, G. (2012): Low-frequency drought variability based on SPEI in association with climate indices in Beijing. Shengtai Xuebao/ Acta Ecologica Sinica 32 (17) , pp. 5467-5475. Telesca, L.; Vicente-Serrano, S.M. ; López-Moreno, J.I. 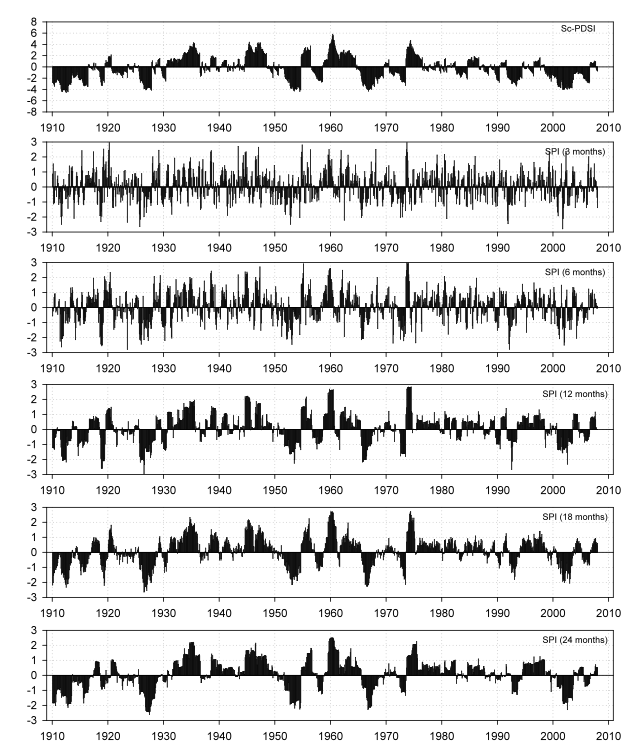 (2012) Power spectral characteristics of drought indices in the Ebro river basin at different temporal scales. Stochastic Environmental Research and Risk Assessment (SERRA). Toromani, E., Mitat Sanxhaku, Edmond Pasho (2011): Growth responses to climate and drought in silver fir (Abies alba) along an altitudinal gradient in southern Kosovo. Canadian Journal of Forest Research, 41: 1795-1807. Vicente-Serrano, S.M., Lasanta, T., Gracia, C., (2010): Aridification determines changes in leaf activity in Pinus halepensis forests under semiarid Mediterranean climate conditions. Agricultural and Forest Meteorology 150, 614-628. Vicente-Serrano, S.M., Juan I. López-Moreno, Luis Gimeno, Raquel Nieto, Enrique Morán-Tejeda, Jorge Lorenzo-Lacruz, Santiago Beguería and Cesar Azorin-Molina: (2011): A multi-scalar global evaluation of the impact of ENSO on droughts. Journal of Geophysical Research-Atmosphere. 116, D20109, doi:10.1029/2011JD016039. Vicente-Serrano, S.M., Célia Gouveia, Jesús Julio Camarero, Santiago Beguería, Ricardo Trigo, Juan I. López-Moreno, César Azorín-Molina, Edmond Pasho, Jorge Lorenzo-Lacruz, Jesús Revuelto, Enrique Morán-Tejeda, Arturo Sánchez-Lorenzo (2012): Drought impacts on vegetation activity, growth and primary production in humid and arid ecoystems. en: Cambio climático. Extremos e impactos. Concepción Rodríguez Puebla, Antonio Ceballos Barbancho, Nube González Reviriego, Enrique Morán Tejeda y Ascensión Hernández Encinas (Eds.) Publicaciones de la Asociación Española de Climatología (AEC), 2012, Serie A, nº 8. Salamanca. 691-699. Vicente-Serrano, S.M., Santiago Beguería, Jorge Lorenzo-Lacruz, Jesús Julio Camarero, Juan I. López-Moreno, César Azorín-Molina, Jesús Revuelto, Enrique Morán-Tejeda, Arturo Sánchez-Lorenzo (2012): Análisis comparativo de diferentes índices de sequía para aplicaciones ecológicas, agrícolas e hidrológicas. en: Cambio climático. Extremos e impactos. Concepción Rodríguez Puebla, Antonio Ceballos Barbancho, Nube González Reviriego, Enrique Morán Tejeda y Ascensión Hernández Encinas (Eds.) Publicaciones de la Asociación Española de Climatología (AEC), 2012, Serie A, nº 8. Salamanca. 679-689. Vicente-Serrano, S.M., Juan I. López-Moreno, Anita Drummond, Luis Gimeno, Raquel Nieto, Enrique Morán-Tejeda, Santiago Beguería and Javier Zabalza (2011). Effects of warming processes on droughts and water resources in the NW Iberian Peninsula (1930−2006) Climate Research. 48: 203-212. Vicente-Serrano, S.M., López-Moreno, J.I., Lorenzo-Lacruz, J., El Kenawy, A., Azorin-Molina, C., Morán-Tejeda, E., Pasho, E., Zabalza, J., Beguería, S. and Angulo-Martínez, M. (2011): The NAO impact on droughts in the Mediterranean region. En Vicente-Serrano, S.M., y Trigo, R., (Eds.) Hydrological, socioeconomic and ecological impacts of the North Atlantic Oscillation in the Mediterranean region. Advances in Global Research (AGLO) series. Springer-Verlag. Vicente-Serrano, S.M., Aidel Zouber, Teodoro Lasanta, and Yolanda Pueyo. (2012); Dryness is accelerating degradation of vulnerable shrublands in semiarid Mediterranean environments. Ecological Monographs, 82, 407-428. Vicente-Serrano, S.M., Santiago Beguería, Luis Gimeno, Lars Eklundh, Gregory Giuliani, Derek Weston, Ahmed El Kenawy, Juan I. López-Moreno, Raquel Nieto, Tenalem Ayenew, Diawoye Konte, Jonas Ardö and Geoffrey G.S. Pegram (2012). Challenges for drought mitigation in Africa: the potential use of geospatial data and drought information systems. Applied Geography, 34: 471-486. Wei-Guang L., Xue Y., Mei-Ting H., Hui-Lin Ch., Zhen-Li Ch. 2012. Standardized precipitation evapotranspiration index shows drought trends in China. Chinese Journal of Eco-Agriculture 20(5): 643−649. Xoplaki, E., Ricardo M. Trigo, Ricardo García-Herrera, David Barriopedro, Fabio D’Andrea, Erich M. Fischer, Luis Gimeno, Celia Gouveia, Emilio Hernandez, Franz G. Kuglitsch, Annarita Mariotti, Raquel Nieto, Joaquim G. Pinto, David Pozo-Vázquez, Hadas Saaroni, Andrea Toreti, Isabel F. Trigo, Sergio M. Vicente-Serrano, Pascal Yiou, Baruch Ziv: Large-Scale Atmospheric Circulation Driving Extreme Climate Events in the Mediterranean and its Related Impacts. In The Climate of the Mediterranean Region. P. Lionello (Ed.) Elsevier. Zorica, R., Milakara Srđan, Šovljanski Ana, Bojivić Jelica, Radenković Tanja (2011): Određivanje i analiza sušnih perioda u osetljivim fenofazma kukuruza u Srbiji. Journal of Scientific Agricultural Research72: 33-41. Abramowitz, M. and I.A. Stegun, 1965: Handbook of Mathematical Functions. Dover Publications, New York. Adams HD, et al. (2009) Temperature sensitivity of drought-induced tree mortality portends increased regional die-off under global-change-type drought. Proceedings of the National Academy of Sciences of the United States of America 106: 7063-7066 (2009). Ahmad, M.I., C.D. Sinclair, and A. Werrity, 1988: Log-logistic flood frequency analysis. Journal of Hydrology 98, 205-224. Allen RG, Pereira LS, Raes D, Smith M. (1998): Crop Evapotranspiration: Guidelines for Computing Crop Requirements, Irrigation and Drainage Paper 56. FAO: Roma, Italia. Barriopedro D, Fischer EM, Luterbacher J, Trigo RM, García-Herrera R (2011) The hot summer of 2010: Redrawing the temperature record map of Europe. Science 332: 220-224. Breshears DD, et al. (2005) Regional vegetation die-off in response to global-change-type drought. Proceedings of the National Academy of Sciences of the United States of America 102: 15144-15148. Ciais Ph, et al. (2005) Europe-wide reduction in primary productivity caused by the heat and drought in 2003. Nature 437: 529-533. Guttman, N.B., 1998: Comparing the Palmer drought index and the Standardized Precipitation Index. Journal of the American Water Resources Association 34, 113-121. Hayes, M., D.A. Wilhite, M. Svoboda, and O. Vanyarkho, 1999: Monitoring the 1996 drought using the Standardized Precipitation Index. Bulletin of the American Meteorological Society 80, 429-438. Hosking, J.R.M., (1986): The theory of probability weighted moments. Res. Rep. RC 12210 IBM Research Division, Yorktown Heights NY 10598. Hosking, J.R.M., (1990): L-Moments: Analysis and estimation of distributions using linear combinations of order statistics. Journal of Royal Statistical Society B, 52: 105-124. Keyantash, J. and J. Dracup., 2002: The quantification of drought: an evaluation of drought indices. Bulletin of the American Meteorological Society 83, 1167-1180. Linares JC, Camarero JJ (2011) From pattern to process: linking intrinsic water-use efficiency to drought-induced forest decline. Global Change Biology 18: 1000-1015. 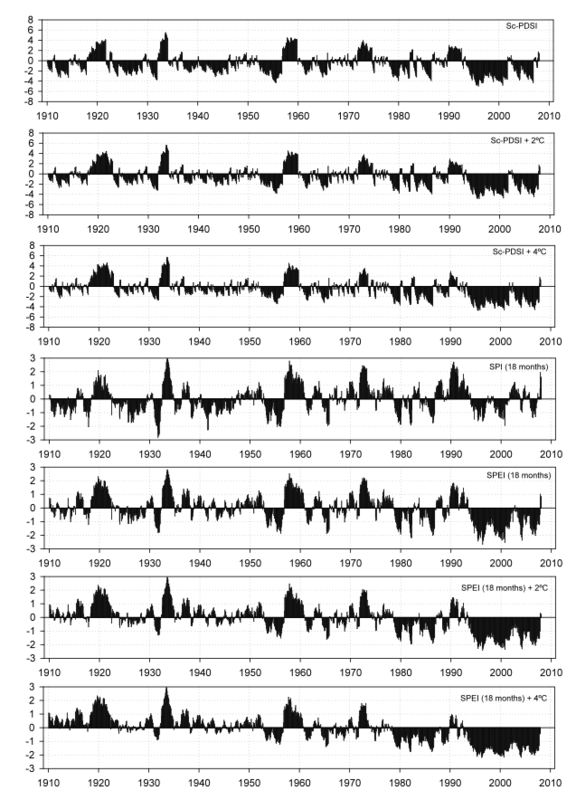 Lobell DB, Schlenker W, Costa-Roberts J (2011) Climate trends and global crop production since 1980. Science 29: 616-620. Martínez-Villalta J, López BC, Adell N, Badiella L, Ninyerola M (2008) Twentieth century increase of Scots pine radial growth in NE Spain shows strong climate interactions. Global Change Biology 14: 2868–2881. McGuire AD, et al. (2010) Vulnerability of white spruvce tree growth in interior Alaska in response to climate variability: ddendrochronological, demographic, and experimental perspectives. Canadian Journal of Forest Research, 40: 1197-1209. McKee, T.B.N., J. Doesken, and J. Kleist, 1993: The relationship of drought frecuency and duration to time scales. Eight Conf. On Applied Climatology. Anaheim, CA, Amer. Meteor. Soc. 179-184. Palmer, W.C., 1965: Meteorological droughts. U.S. Department of Commerce Weather Bureau Research Paper 45, 58 pp. Rebetez M, et al. (2006) Heat and drought 2003 in Europe: A climate synthesis. Annals of Forest Science 63: 569-577. Singh, V.P. and F.X.Y. Guo, 1993: Parameter estimation for 3-parameter log-logistic distribution (LLD3) by Pome. Stochastic Hydrology and Hydraulics 7, 163-177. Thornthwaite, C.W., 1948: An approach toward a rational classification of climate. Geographical Review 38, 55-94. Wells, N., S. Goddard, and M.J. Hayes, 2004: A self-calibrating Palmer Drought Severity Index. Journal of Climate 17, 2335-2351. Williams AP, Xu Ch, McDowell NG (2011) Who is the new sheriff in town regulating boreal forest growth?. Environmental Research letters 6: doi: 10.1088/1748-9326/6/4/041004. All texts and images licensed under a Creative Commons Attribution 3.0 Unported License. Data licensed under the Open Database License. Code licensed under the GNU Affero General Public License.